Staff members at the University of PNG have claimed that armed policemen entered the Waigani campus and shot at students, resulting in the death of three students. A fourth student died later from gunshot wounds. The PNG Media Council has called on all sides in the country's civil unrest over privatisation to respect the role of journalists. Council president Peter Aitsi made the plea after several reports that media staff had been harassed and assaulted by both police and protesters. The New York-based Committee to Protect Journalists has called for the immediate release of two Belgian filmmakers kidnapped by separatists in Indonesia's remote Papua (Irian Jaya) province. An adjudication on a complaint by Caf� Pacific publisher David Robie over an unbalanced and distorted Islands Business item in its July 2000 edition Whispers column about the temporary closure of the University of the South Pacific's award-winning journalism website. Robie regards the adjudication as prejudiced and procedurally flawed. The Fiji caretaker government has launched a counter-attack at a leading NGO that's been challenging the regime's legitimacy.The Citizens Constitutional Forum has been suddenly deregistered as a charitable organisation by the caretaker government, and international organisations have joined in the local condemnation of the move. Three university students have been confirmed dead amid widespread looting and destruction of businesses in Port Moresby after six days of peaceful protest against World Bank and International Monetary Fund restructural plans for the country. Prime Minister Sir Mekere Morauta has appealed for calm. Prime Minister Sir Mekere Morauta has made a special appeal to protesters to stop their demonstrations and restore peace and calm to the streets of Port Moresby. An overnight curfew has been slapped on the Papua New Guinea capital a day after three people died during student protests against IMF-backed economic reforms. Papua New Guinea and Bougainville island secessionist rebels have agreed to a settlement, granting the island autonomy and ultimately an independence vote. The agreement ends a 12-year conflict. Russell Brown's outspoken new Mediawatch programme on Radio New Zealand has exposed the hypocrisy of news media organisations in their handling of disputes with journalists. The Indonesian press retains many of its less-than-satisfactory qualities three years into the so-called reform era. Pundits assessing press performance said in a recent discussion that they found that the "culture of lies", official statements, disinformation and biased reporting remained pervasive. Fiji's Qarase regime has written to the Vice-Chancellor of the University of the South Pacific to inform the administration of the caretaker government's displeasure over two academics presenting a critical seminar on the post-coup economic status of the country. The two academics are Dr Mahendra Reddy, who is also secretary of the academic staff association, and Dr Umesh Chand. Follow-up: Regime tries to gag USP academics on People's Coalition website. The Fiji Sun published an article on a Trotskyist revolutionary perspective on Fiji's political crisis and incorrectly attributed this to a Maori writer called "Te Karere Ipurangi". Of course, there is no such Maori writer - it is the name of a section on Fiji coup links on the Maorinews website. 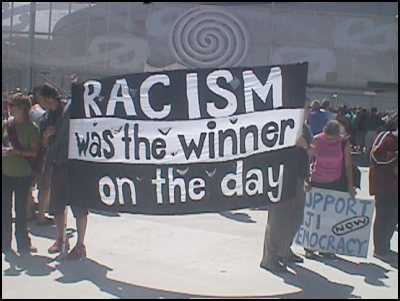 The People's Coalition Government site then republished two pieces sourced from the Fiji Sun publication --"Nationalist land, says Maori" (13 June 2001), and "SVT government was corrupt" (11 June 2001). For those interested in reading the original, unabridged article, check it out on the International Bolshevik Tendency website. The treason preliminary hearing of Fiji coup leader George Speight has been delayed for the third time after his new US-based lawyer ran into trouble trying to win admission to the Fiji bar. It is not a question of if others are spying on Fiji but of who, how and, to a much lesser extent, why. While it might all sound like a piece of X-Files paranoia the simple fact is this: during last year's coup Australia and New Zealand were spying in the classic sense. New Zealand human rights activist Maire Leadbeater is questioned by Indonesian police along with some 31 other foreign academics, activists and non-government organisation officials after a raid on an Asia-Pacific conference in Jakarta focusing on globalisation issues. "The Anti-Bases Campaign is pleased to announce that, for the first time, an issue of our newsletter, "Peace Researcher" is now available on line. This is much faster than the hard copy version, which hasn't even gone to the printer yet.It's a no frills edition (text only, no graphics)." Click on Peace Researcher. Chinese authorities have removed the top editors of the country's most probing major newspaper, Southern Weekend, in a crackdown on its semi-independent reporting. George Speight, Fiji's coup plotter who held his nation's government at gunpoint for 56 days, has been finally able to speak in public and in the process revealed himself as a man arrogantly unrepentant and able, even from a courtroom dock, to effortlessly control proceedings. In the Cook Islands, a row has broken out between the body representing independent media outlets and the body claimed to be acting as a media mouthpiece for the Government, reports Pacnews citing Radio Australia. When New Zealand Prime Minister Helen Clark arrives this month she'll no doubt find much of the old time magic that makes the Cook Islands a special place and people.It will be a day of celebration over a 100 year relationship that has, if anything, got closer and closer. But there will be little time for awkward questions about a legacy which has left most Cook Islanders with no desire to live in their own country. "It is hard to imagine any Pacific newsroom 12 months hence without a much thumbed copy of The Pacific Journalist, simply because it brings together under one cover so much information that is of value to journalists working in the region. Mr Robie and those who have contributed the excellent articles deserve commendation for this publication". This review by The National's executive editor is an informed answer to the biased and factually flawed article by Laisa Taga, of Pacific/Islands Business and circulated widely by Pina Nius Online to Pacific media. This new website examines press coverage of HIV/AIDS in Papua New Guinea and several other South Pacific countries including Fiji, Samoa, Tonga, Tahiti, New Caledonia and Micronesia. With the increasing spread of HIV/AIDS in the South Pacific region, it is vital that everyone unites in an effort to contain and slow the epidemic. The press, in particular, is well placed to influence public opinion about the disease. An unidentified gunman wounds the Premier of the Guadalcanal Province, Ezekiel Alebua, in what may have been an assassination attempt. Wars, coups and bloody conflicts are increasingly common in the Pacific region. Reporting these events is difficult especially when national governments denounce journalism and intimidate the media. 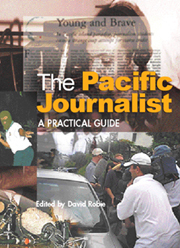 The only defence available for the region's young and inexperienced journalists is accurate and balanced reporting, says a new book on Pacific journalism. Reporting of George Speight's attempted coup in Fiji finally get an airing at a workshop staged by the Fiji Media Watch non-government organisation a year after the start of the crisis. Critics of the coverage were not invited. ABC Online, the Australian Broadcasting Corporation's popular and award-winning content provider, has received further recognition of its commitment to the arts and the Asia Pacific region with its arTok site recently nominated for an Australian Teachers of Media Award (ATOMS). A navy patrol boat brings Fiji coup plotter George Speight and his henchmen into the capital Suva ahead of the start of the torturous process of trying them on the capital offence of treason. But on the first day of the preliminary hearing, Speight sacks his lawyer, causing a further delay. "While it is discouraging that the main media outlets are controlled by the most powerful interests, a mobile intellectual energy can take advantage of the platforms available for use. On one side, six enormous multinationals presided over by six men control most of the world's supply of images and news. On the other, independent intellectuals form an incipient community, physically separated from each other but connected to a great number of activist communities that have access to other kinds of what Swift sarcastically called oratorical machines." The sacking of PNG National Broadcasting Corporation's managing director Bosky Tonny this week, and an attempt to sack the publisher, editor and a reporter of the Word Publishing Group have been condemned by the PNG Media Council which is celebrating Media Freedom Week. Powerful commercial media are seeking to gain total control over the airwaves. Imagine a world in which a handful of global media conglomerates like Vivendi, Sony, BskyB, Disney, and News Corporation - owners of the Fiji Times - own literally all the airwaves all over the planet and trade them back and forth as "private electronic real estate". A strategy is beginning to unfold in Washington DC to make that happen. "New Zealand's firm and self-confident diplomatic approach to Fiji in the wake of the recent ham-fisted racist coup attempt appears to have raised some hackles among supporters of Fijian nationalism. Well it would, wouldn't it?" Reply by a prominent Australia, New Zealand and Pacific radio journalist to Laisa Taga's article, Why New Zealand is offside with the islands. Two Pacific news services are at loggerheads with one agency's chief executive accusing the other competitor of "piracy". The pioneering Pacnews service has served the region for more than 14 years and has become a self-supporting business, but is now feeling the heat from PINA Nius Online, a free and freely criticised service. Vice-Chancellor Savenaca Siwatibau has compared the University of the South Pacific with quality international universities when launching three new books published by academics and writers from the institution. He described the books as an example of dynamic work being done by the university's staff. Siwatibau was speaking at the launching of a media book, The Pacific Journalist, edited by USP journalism coordinator David Robie; Eating Mangoes, by literature lecturer Mohit Prasad; and history/politics lecturer Robert Nicole's The Pen, The Word and The Pistol. Order online at the University of the South Pacific Book Centre. A leading Fiji newspaper publisher has warned against "black banning by editors", calling for local media to be more ready to acknowledge their mistakes and to apologise. Ranjit Singh, publisher and general manager of Fiji's Daily Post, says this is an important role of responsible news media. Rebel soldiers in Papua New Guinea have ended their week-long rebellion but have called for an end to Australian and other foreign influences on the nation's troubled economy. Rebel leaders have met PNG Prime Minister Sir Mekere Morauta, members of his cabinet and army and police commanders to present a petition of their concerns over defence force reforms and foreign intervention in the economy. Poor and the disadvantaged people will pay the price for the "illegal, unconstitutional and unlawful" decision of Fiji authorities, says "dismissed" elected Prime Minister Mahendra Chaudhry. Critics continued to accuse President Iloilo of acting illegally. Unelected banker Laisenia Qarase has been appointed caretaker prime minister to lead Fiji togeneral elections later this year as criticism describes the president's controversial efforts to resolve the country's political impasse as illegal. The Commonwealth Secretary General's special envoy has warned Fiji's Great Council of Chiefs that the country faces dreadful repercussions if it doesn't follow the Court of Appeal ruling. From Irian Jaya to Fiji, a new generation is ready to tear down colonial-era boundaries. "John" Koknak, the "Jesus of Melanesia"has his home in the jungle along the Fly River which marks the southern border between Papua New Guinea and Indonesia, where he is commander of the OPM (Free Papua Organisation) guerilla movement opposing Indonesian rule over West Papua. Koknak tells of his arrival at the University of PNG campus in Port Moresby in 1982 and the links between Melanesia's Class of '82. You need to meet your relatives who are in Indonesia, and from where you are in East Timor the village has no telephone, let alone wartel (communications kiosk) or e-mail facilities. Don't worry, just contact the local radio station -- meaning coming in person to meet broadcasters -- and request them to convey arrangements on where and when to meet. The Fiji Times has criticised the Great Council of Chiefs for its failure to name a national president after a two-day meeting, saying the council risked being seen as an "archaic body with little relevance to modern-day Fiji". A decision on the appointment of a national president has been deferred. Sitting in a cybercaf�, a single person can tell the whole world about repression in their country. In just a few minutes, a newspaper suffering from censorship can publish itsarticles on French or American servers. The Internet has radically changed the traditional balance of power between governments and those who produce information. Governments are on the defensive; they all want the Internet, but dream of a network under their control. This dilemma has engendered an arsenal of repressive solutions. The Fiji Court of Appeal has declared the military-backed government illegal, after a court battle which pitted two of Britain's leading human rights lawyers against each other. Fiji's three daily newspapers have cautiously welcomed the historic Appeal Court ruling upholding the 1997 multiracial constitution, but the illegal regime has signalled it will not immediately resign. Fiji's interim regime says it will review the Court of Appeal judgement before making a decision, although interim Prime Minister Laisenia Qarase had earlier pledged the administration would abide by the outcome of the Court's ruling. The Fiji Court of Appeal has ruled that the 1997 multiracial Constitution is still supreme law - but reaction has been mixed. Two University of the South Pacific politics lecturers consider the judgement a good one, but are cautious about how some in Fiji will respond. Fiji's newest daily newspaper, the Sun, has challenged some of its rivals over "interpretations" of media freedom in the wake of allegations of suppression of information by broadcast news media during the Court of Appeal constitutional hearing this week. Fiji is daily drifting further and further away from being the civil society it could have become had it not been for deep-dyed racism within the indigenous Fijian tribal establishment, writes veteran NZ journalist Gordon McLauchlan. Queen's Counsel Geoffrey Robertson, the lawyer for the internal refugee farmer Chandrika Prasad challenging the interim regime, has told the Court of Appeal to disregard press articles, particularly those appearing in the Fiji Times, the Fiji Times reports. Police threats to arrest media people and personalities involved in a "leaders forum" current affairs programme for broadcast by Fiji Television have forced the country's sole station to postpone the item, media reports say. The respondent in Fiji's constitutional case, Muainaweni farmer Chandrika Prasad, feels confident he will attain another victory when the Fiji Court of Appeal finally makes a ruling on Justice Anthony Gates' decision to uphold the 1997 multiracial constitution, the Fiji Sun reports. Fiji's deposed Prime Minister Mahendra Chaudhry has called for commitment and unity. In a message to the nation, the leader of the Fiji Labour Party and the People's Coalition Government reiterated his party's commitment to work towards the restoration of peace, democracy and the rule of law. A groundbreaking constitutional case opens in Fiji which will decide the legality of a regime widely criticised for quashing democracy and oppressing its ethnic Indian citizens after the May 2000 coup by the failed businessman George Speight. FIJI: WHY IS CHERIE BOOTH'S MATRIX CHAMBERS SO KEEN TO DEFEND A DESPOTIC GOVERNMENT IN FIJI? Matrix Chambers has made its choice. Tomorrow Nicholas Blake QC, its star barrister, will lever himself to his feet and tell the Fijian Court of Appeal in Suva that the island's racist government is above the law. It was born out of the invasion of parliament by gunmen, and is building what Amnesty International describes as a 'new Apartheid' in the Pacific. Nevertheless, he will argue, it is quite impertinent for the judiciary to describe the regime as illegal. The stage is set for the Court of Appeal sitting this week that will decide the future of Fiji in the wake of failed businessman George Speight's attempted coup last May. The court will rule on Justice Anthony Gates' judgement last November which declared the 1997 multiracial constitution was still the supreme law of the country and called for the elected Parliament to be reconvened to form a legal government. Excepting some brave and competent journalists, the local media are often an impediment to the march to Fiji enlightenment. Lately, the regime has been going after the messengers. And, courageously, the University of the South Pacific has recently upheld academic freedom and firmly opposed a deplorable attempt at censorship by journalists. The United States has its Pulitzer Prizes. Australia has the Walkleys. And journalism education in the region has the Ossies, the Journalism Education Association's awards recognising excellent journalism produced by students. University of the South Pacific - especially the Fiji coup coverage - and New Zealand entries dominated the latest awards. The Tongan Government has criticised a report last month by the Agence France-Presse news agency alleging that senior Tongan Government officials and members of the royal family are involved in corruption and drug smuggling, Pacnews reports. The Indonesian government will not allow United Nations administrators in East Timor to try retired three-star general Yunus Yosfiah on charges of killing five Australia-based newsmen there in 1975, says a senior minister. "Why do Pacific Islanders want to become journalists? In spite of often tense relationships between governments and the media in the region, and poor pay and working conditions, growing numbers of young Pacific Islanders are choosing a career in journalism -- and usually seeking formal qualifications." Forthcoming title that looks at the practice and the politics of journalism. When big rugby winger Jonah Lomu fumbled the rugby ball in a match against Fiji in February it signaled not just the embarrassing loss of a major match but also a serious botch-up in Wellington's foreign policy. Senior diplomats told AFP that New Zealand risks losing its reputation in the one area of the world it matters. EAST TIMOR: Opinion: BALIBO KILLINGS: BEGINNINGS OF IMPUNITY? Indonesia's New Order liked to change local street names with that of its generals; in East Timor, journalists also saw it fitting to commemorate colleagues killed in the territory. A three-kilometer road from the Becora area in Dili to the old Mercado (market) now bears the name "Press Freedom Road". The name change has been made to commemorate at least nine journalists who have died on duty there - including the Balibo Five. Prominent independent Australian and New Zealand journalists have been attacked by Fiji's interim regime and sympathetic news media, embarrassed by the country's poor post-coup international image. Award-winning Australian investigative journalist Mark Davis came under fire over an SBS Dateline documentary on the plight of Indo-Fijian cane farmers. New Zealander Michael Field has also come under fire. "George Speight, the public face of 19 May 2000, is being tried for treason. Yet Fiji's troubles are far from over, and it's now bracing itself for another wave of violence. In a fortnight, Fiji1s highest court will decide whether the post coup government is illegal. If it does, no-one's sure if that government will surrender control and there's no great confidence the army will carry out the court's wishes. This unelected government meanwhile is radically changing policy along classic Speight lines. It has vowed to introduce indigenous supremacy through a raft of racially exclusive policies." Each week, Media Flash provides free, online insiders' information about Australia's media industry - an industry that is dominated by a handful of multi-billion dollar corporations. A profile on the website publisher Ash Long's campaign to "keep his head above water". A development economist has appealed to Fiji's Native Land Trust Board to "come clean" on its real motives if a long-lasting solution to the land problem is to be found for the country. Condemning some landowners and the NLTB over "exploitation and intimidation" of mainly Indo-Fijian tenant farmers, University of the South Pacific's Dr Mahendra Reddy says the girmit era of indentured labour may return to Fiji. The Fiji Sun has condemned Fijiian indigenous nationalists seeking a "selfish and narrow agenda" with the threat of terrorism such as experienced during last year's coup crisis. Responding to a Close-Up current affairs programme on Fiji Television on 28 January 2001, the newspaper singled out a nationalist leader, Ratu Esira Rabuno, for strong criticism in an editorial, saying people like him had an "awesome responsibility in working for peace and justice - truth - in this country". Pacific journalists need a better understanding of the impact of their reporting on society and the responsibility of media in an age of rapidly changing new media technologies, says prominent Fijian editor and columnist Mesake Koroi. The Fiji military and the ousted elected government have both accused the Fiji Times of misreporting, appealing to the newspaper and other news media to be "more responsible", say local reports. Advertisements by the military describe the newspaper's failure to correct "misguided reports" as "contemptible". Fiji's Court of Appeal will have to rule on who is the Pacific nation's effective government now and not on the issues of the 2000 coup, says leading New Zealand barrister Anthony Molloy, QC, involved in the case. Pro-democracy opponents will have to show there is a "rival competing government" ruling or ready to rule. "The University of the South Pacific has become the centre of excellence in the region, as indeed any university of USP's nature should be. Apart from teaching and research, the university has in many ways become the critical conscience of the region. " Fiji journalists and news media have been criticised over journalism standards by Prime Minister Laisenia Qarase of the military backed interim regime, saying that sometimes the results "compromise the ideals of a free press", local newspapers report. The University of the South Pacific has been praised for its role as a defender of good governance and human values in the face of mounting political crises and pressures such as the Solomon Islands ethnic upheaval and the coup in Fiji. Economist Dr Biman Prasad describes the institution as having "in a way become the critical conscience of the region". A decision to deport the expatriate publisher of Vanuatu's twice weekly newspaper, Trading Post, has backfired on the Vanuatu Government. British citizen Marc Neil-Jones, who was deported to Australia on January 19, is back in Port Vila after the Acting Chief Justice, Vincent Lunabek, issued a court order nullifying the deportation order. While a number of editors in PNG and the South Pacific should be highly commended for the way they have responded to the threat of HIV/AIDS in their countries, the time has come to step up coverage and allocate more space for information about prevention and to embarrass government officials into greater action. This is extremely difficult because of cultural sensitivities and financial sponsorship. By Michael Field Korea's 'Moonies' are emerging in the Pacific and have nearly bought one government down and have linked up with another military backed regime. The Unification Church, headed by Reverend Sun Myung Moon, is following a well-worn missionary route through the Pacific where he is competing with deeply entrenched Christian churches operating in states which enshrine Christianity in constitutions. Digital technology, such as the Internet, has presented a variety of opportunities for journalists and news organizations in the Pacific. But it has also raised serious ethical concerns for the media in the region, says John V. Pavlik, executive director of the Center for New Media at Columbia University. The inauguration on January 20 of George W. Bush as 43rd president of the USA will see the installation of a government consisting of some of the most reactionary capitalist politicians available. The 10th anniversary edition of Green Left Weekly examines the background and record of key figures in the new Bush administration and the implications for the poor of the world. Top British legal guns, including a Queen's Counsel who defended Chilean dictator Augusto Pincohet, have been hired by Fiji's military backed government to defend its legitimacy in the Pacific nation's courts. The Fiji Times newspaper has been criticised by the deposed elected government's website for saying in an editorial that peace comes first and justice later, reflecting the position of the illegal regime over the Gates' judgment. The hijacking of an elected government in Fiji on 19 May 2000 and political developments thereafter suggest that plans by a close-knit group to muscle their way into power under the pretext of indigenous Fijian paramountcy failed miserably. Seven months after an ethnically inspired coup plunged Fiji into civil chaos, the Pacific's regional university continues to mirror the political tensions that have bitterly divided the 850,000 inhabitants of this one time British colony. While fewer journalists were killed or arrested in the year 2000 than in 1999, more than 300 media people or news organisations were censored. The Academic Staff Association at the University of the South Pacific has thrown its support behind the head of the university's journalism course, David Robie, whose latest clash with sections of the Fiji media has led to a call for his dismissal. The Staff Association alleges that several news organisations in Fiji are waging an orchestrated campaign against Mr Robie. 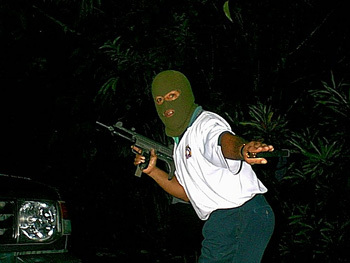 On 19 May 2000, an insurrection led by failed businessman George Speight and six renegade members of the �lite First Meridian special forces squadron engulfed the Fiji Islands in turmoil for the next three months. In the early weeks of the insurrection, the media enjoyed an unusually close relationship with Speight and the hostage-takers, raising ethical questions. This paper examines the reportage of the coup and the media controversy leading to the insurrection.